“Speak, Lord, for your servant is listening” (1 Samuel 3:10). The Apostles offer a variety of discernment events for young women (ages 18–35) who are discerning a call to religious life and are interested in prayer, community, and/or service with the Apostles. Please visit our event registration page to sign up. 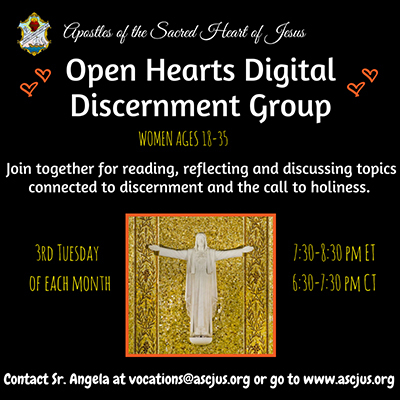 Join the Apostles and other discerning women on Zoom on the third Tuesday of each month for an hour to share on topics connected to discernment and the call to holiness. For more information, please contact us by email. “Come away by yourselves to a secluded place and rest awhile” (Mark 6:31). 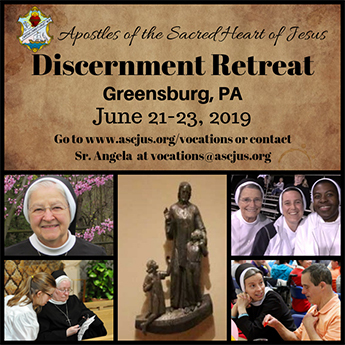 We will offer discernment retreats for young women several times a year in different places from a Friday evening to Sunday morning. The retreats will offer young women time for quiet and prayer. It will also provide an opportunity for dialogue with a team of sisters and other discerning women. For more information, please contact us by email. Acts of Apostles are events in which young women can offer service alongside the Apostles. In addition to serving with the sisters and living in community, there is an element of prayer and reflection each day. The duration can range from one to five days. Please visit our Acts of Apostles page to learn more. Discerning women may want to spend a period of time with the sisters. They follow the community’s schedule and participate in their ministries. Come and See experiences are dependent upon the needs and availability of each young woman and local communities. For more information, please contact us by email.